One of the key things Jesus came to do is help us experience breakthrough in our lives. He came to bring us close to God so that we can know God and walk with God. He came to break into our world and break into our lives. He came to break the power of sin and shame and darkness and the chains of oppression. This is known as the “in breaking of God” into the world. That is Jesus came to break into our lives. 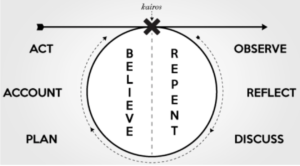 Jesus tells us the “time” has come and we are to “Repent” & “Believe”. This is supposed to help you experience continuous breakthrough in your life. Everybody is going through something. The question is what are you going through. è This repent side is about “what is God saying”? Lots of times people just stop here… but if we did it would only be halft of the Gospel….we want to take it further. Plan…. How do we step into what God is doing? è This believe side is about “what am I going to do about it”? This is the part that helps us walk in God’s power.